Watsonville, Calif. — ExpoImaging, Inc., which markets, designs, manufactures and distributes innovative camera accessories to the photographic market, today announced availability of the Rogue Grid, the newest addition to its Rogue FlashBender product line. The patent pending Rogue Grid is uniquely designed to produce three different honeycomb grid angles. 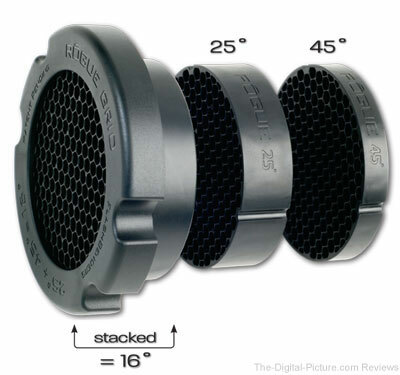 A 25˚ grid and a 45˚ grid align and stack to create a 16˚ grid, producing three distinct levels of spot lighting control in a compact and lightweight package. The durable Rogue Grid securely attaches to almost all standard shoe mount flashes using the included adjustable tension strap. Weighing just 3.5 ounces, the versatile Rogue Grid comes with a small nylon pouch that stows easily in a photographer’s camera bag. The grid’s innovative modular design allows for easy changing of grid angles or the addition of lighting gels. The Rogue Grid is designed to work with the popular Rogue FlashBender reflectors as it fits securely into the end of snooted reflectors. 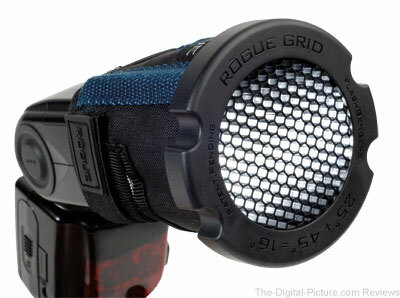 “As we showed with the Rogue FlashBenders, our goal is to create innovative and versatile tools that are durable and well-constructed,” said Erik Sowder, CEO of ExpoImaging, Inc. “The 3-in-1 Honeycomb Rogue Grid continues that mission by providing more light control while saving space in photographers’ gear bags. No other grid is this flexible or, I think, as cool-looking as the Rogue Grid." When attached to a light source, a honeycomb grid creates a spot of light with a gradual fall-off useful for adding dimension and depth to an image, or for highlighting important features. When attached to an accent or background light, grids help draw attention to an object, texture, or color, and can help to create a desired atmosphere or mood. The angle of the grid determines the size of the spot projected forward, with smaller degree grids producing smaller spots, and larger angles producing larger spots. The Rogue Grid is available now through ExpoImaging’s distribution partners worldwide, or online at www.expoimaging.com, for $49.95. Created by ExpoImaging, Rogue Photographic Design is a new line of innovative lighting equipment for small strobe lighting enthusiasts. These versatile new lighting tools provide photographers with remarkable power to control the light from their shoe mount flashes. More information about offerings from Rogue Photographic Design is available at www.expoimaging.com. ExpoImaging's Rogue products are available at B&H.